From an early age, Leslie Badue knew she wanted to be an influencer and community activator. Her earliest recollection of questioning injustices was when she was in fourth grade and she asked her grandma who decides if one of her favorite cousins goes to jail. “I grew up the generation after the War on Drugs, and so everybody that was being incarcerated looked like me, right? But everybody that was making the decisions didn’t,” Badue said. Now, at age 25, after taking other leadership positions and fighting for social equity on the front lines, Badue has the opportunity to create change as the newest president of the NAACP Minneapolis chapter. Badue said she was already planning to run for chapter president in November regardless of Sole’s decision to step down as current president. Before Sole, the chapter president was former mayoral candidate and civil rights attorney Nekima Levy-Pounds. Both Sole and Levy-Pounds only served half of their two-year presidential terms. In a position that has experienced a high turnover rate, Badue said she is here to stay. She will serve her time filling out Sole’s term and, if elected in November, said she has every intention of serving the full two-year term. Badue moved to Minneapolis to attend the University of St. Thomas, where she had Levy-Pounds as a professor. During Badue’s first year at St. Thomas, Levy-Pounds ran for NAACP chapter president and Badue went to support her. That is how she first got introduced to the chapter. Badue’s first position at the chapter was serving on the criminal justice committee, which Sole directed. In January of 2016, Badue became the chapter’s education chair. When Levy-Pounds left to run for mayor and Sole stepped in as president, he asked Badue to come on as his one of his vice president’s. Now she is president. Given her experience with education, Badue wants to bring it to the forefront of the chapter. “A lot of time we focus on criminal justice, but you can’t talk about criminal justice without talking about education,” Badue said. In addition to education and sustainability, Badue wants to implement her three C’s of success: communication, collaboration and compassion. She knows historically America has focused on changing laws and policies, and she recognizes the importance of that, but she said one of her biggest priorities is to change people’s hearts, minds, and the way they think. “What I want is to see everybody coming together to activate this community ecosystem that’s built on a foundation of those three C’s,” Badue explained. Badue grew up in inner-city Washington, D.C. where she attended Watkins Elementary and McKinley Technical High School. In high school, she served in multiple leadership roles including secretary and treasurer of the student government. After high school, she moved to Miami to attend Barry University, where she majored in political science and minored in African studies. While at Barry she served as the student body president. 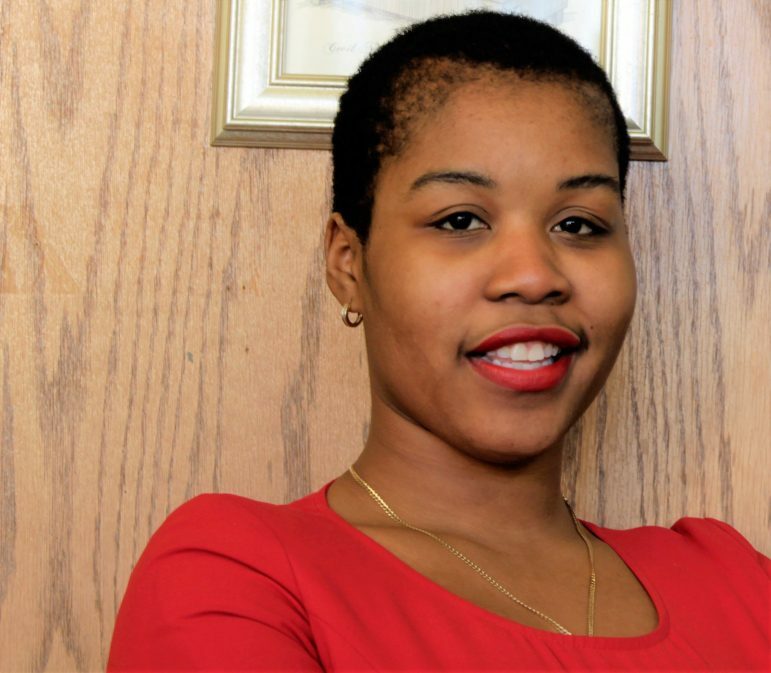 She came to St. Thomas in 2015 to pursue a JD-MBA (Business and Law Degree). Badue knows the degree will always be there if she wants it, but to stay true to her path now has meant withdrawing from St. Thomas and academia. “I don’t need anybody’s acknowledgment in my greatness. I don’t need any degrees to make me a human being,” she said. Keith Schubert welcomes reader responses to kschubert@spokesman-recorder.com. Wonderful story. Community can focus on moving forward in a healthy way with Leslie’s leadership…from the heart.